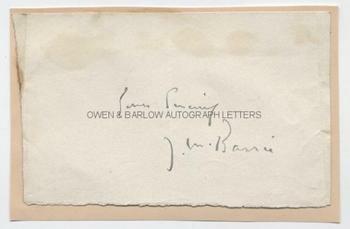 J M BARRIE Autograph Signature. Sir James Matthew Barrie, British (Scottish) author and playwright. Author of 'Peter Pan'. Autograph presentation signature and the words "Yours sincerely" on paper laid down by its top edge to part of an album leaf. The paper piece measures approx. 5.5 x 3.5 inches. This is not a clipped signature from a letter but a specimen autograph written purposely for a collector. From the album of Miss Evelyn Grey, a young lady who began collecting autographs to pass the time whilst convalescing in hospital during the First World War. She seems to have had a particular penchant for novelists as many of the autographs in her album were of popular authors of the day.